Official business calls me to cross the Atlantic tomorrow and I'll be spending the coming week in Ottawa. As I just browsed through the schedule I've been sent I realize that I just might get a few hours of spare time. So the question is - Does anyone have any recommendations for where to go to gaze at nice FP's? As so many I also could take a few hints to where to look at secondhand (or should they be called "Vintage"??) pens. Bienvenue à Ottawa, hope you enjoy your stay here. Wallacks, 231 Bank Street, an art supply shop that carries Watermans, Parkers, Pelikans, and a few others brands. Not a pen shop as such, but a pretty good assortment of good modern pens. 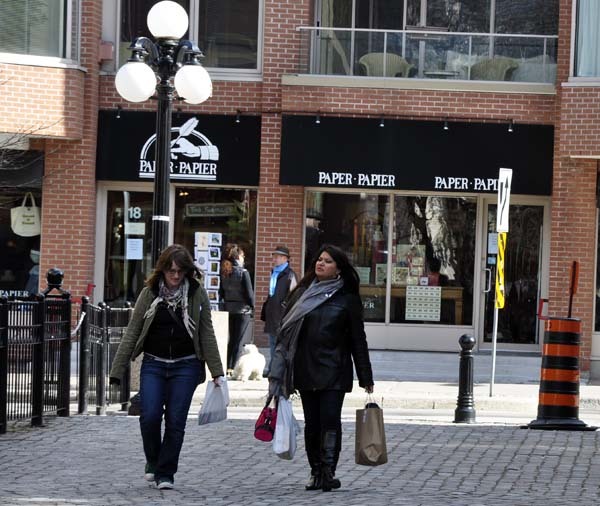 Paper Papier, at 18 Clarence Street, in the Byward Market area -- see photo below, that was taken some days ago. Lots of very nice restaurants and coffee shops nearby, where you will be able to try out your pens and the paper you can buy in the very same store. I wouldn't count on finding anything vintage around Ottawa. Most of us pen enthusiasts raid the local antique malls and such on a regular basis, so there is very little left to pick, except perhaps, if you're in luck. Edited by Fernan, 03 May 2009 - 03:22. Thanks for the directions, hope that I`ll have the time to visit them. There is a Tulip Festival going on currently in Ottawa, not pen related, but interesting, especially the entertainment if you have time. Indeed, our monthly meeting was last Tuesday April 28th. I was able to find the Wallacks shop this afternoon and was a bit disappointed. Sadly the exchange rate of swedish kronor into Canadian dollars wasn`t helping the impression, and I made no buy. I guess the personnel cant be blamed for my countrys low rating on the currency market but honestly they seemed a little too un-interested in selling anything. Sad, because otherwise my impression of Ottawa has been nothing but very positive. I'm returning back to Ottawa from college for the summer, and was wondering if there is any good place to buy FP ink in town. I wasn't paying attention to these sort of shops when I was living in Ottawa. Though I been to PaperPapier, and really liked the store environment. But I didn't try making a purchase though, I was accompanying someone else. Ohh, I wish I'd joined FPN sooner! I lived in the Golden Triangle for two years while training at CHEO and was still using ballpoints then (hadn't discovered water resistant inks). Glad I found this post, I will be spending a couple of days in Ottawa in the near future. Hope I can make it down to the Market. I've been lurking on here for some time now, and when I had an opportunity to go to Ottawa, I finally decided to register. Here in Raleigh, NC it's hard to find a place to actually hold a good pen, so I may be checking out these places next week when in Ottawa. In one month I've gone from being surprised that I'd pay $30 for a pen (Lamy Al-Star) to thinking $200 is a good deal. I love writing with the Lamy. Hope to hold and maybe buy a Pelikan or something a little more forgiving (gold and malleable). Anything new in the pen world around Ottawa since the last time this thread saw the light of day?